Today is St. Patrick's Day, and there is no corned beef on the horizon for me. I *am* wearing lots of green, though, because getting pinched would just make a lousy day worse. Emotionally I'm still incredibly happy and optimistic, but less than three weeks after my last cold, I'm back to being sick. Seriously, though ... I used to get sick once a year at most! Perhaps my newfound lack of immunity to disease is from working with the public - a few of my students are sick now, too. Or from spending so much time at the gym - it's easy not to get sick when you don't go out and do things with other possibly sick people. I'd like to think this is not another thin person thing that I will have to get used to, because I'd be okay with crying over every new pair of jeans for the rest of my life as long as I don't have to cough myself to death so often! Tonight I'm skipping the gym in favor of soup for dinner and early bedtime - as long as I feel better, I'll make it up tomorrow. I have to take care of myself and get well so I can fully enjoy my Spring Break! I'm looking forward to spring cleaning, and I'm hoping that the weather isn't as dreary as the forecast looks right now, because I'd love to go down to the lake for my first outdoor run in Chicago! I don't think I ever noticed your tattoo before. I love it. Just sayin'. i love Golden Girls!! Hope you feel better soon!! 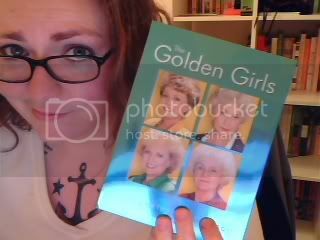 Oh my gosh, I used to watch the Golden Girls all the time - weirdly addicting! I hope you get better quick! Take care. Get well soon!!! I would definitely say school is the worst place to get sick - because I noticed when I gained weight I got sick way more often... I wouldn't say it's a thin thing at all. I really hope you feel better soon. I wouldn't question being sick too much, a cold is just a cold, it can happen to anyone. There may just eb more around at the moment. I wouldn't run if it is in your chest though. UMM, I'm sorry..did I read that you BURNED 1050 calories!??? That is awesome!!! I'm pretty sure I could never ever burn that much..takes me several days to burn that much actually. Jealous!! How long were you on that thing? I hope you feel better!! I just got over being sick and it's NO fun. I am hoping all of the cold weather is out of our system now. Yay Spring. And gotta agree with Meghan, 1050 calories is crazy awesome. Do you always burn that much when you go to the gym? Golden Girls are my favorite! Dorothy is my favorite! Her outfits are ridiculous, but she and Sophia crack me up! All the stories about St. Olaf got on my nerves, and Blanche being a hoe was always a favorite when Sophia was cracking jokes. Great show! I've seen every episode a bazillion times! Get well soon!! Definitely rest easy so you're back up in no time. LOL, the Golden Girls, that should cheer you up. 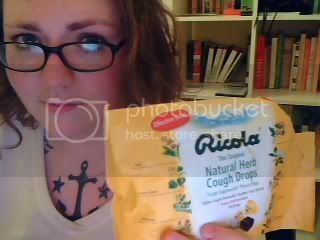 Whenever I say (above a whisper) that I never get sick...I get sick. I try not to even think it anymore. Get well soon. B) I can't believe everyone else seems to like the Golden Girls.